We are excited with the latest Press Release from Libelium regarding our official RIOT platform has been officially part of Libelium IoT Marketplace together with the rest of world’s leading IoT Platform providers. Libelium IoT Ecosystem includes interoperability with more than 30 strategic cloud partners integrated in the new Meshlium generation, the IoT Gateway, that features ten times better performance than previous version. Today, at Smart City Expo, Libelium presents a new radical design of Meshlium IoT Gateway, with features improved and adapted to customers needs. With this new batch of Cloud Partners – of a total of 33- Meshlium keeps its leadership as the most compatible gateway in the IoT market allowing developers to select any cloud server. To keep on supporting compatibility with any Cloud platform, the IoT gateway upgrades to a CPU ten times faster and a RAM memory eight times bigger. Connectivity speed also increases to achieve fast Internet connection and data synchronization by upgrading cellular radios to 4G and WiFi-n.
“It is the first IoT gateway in the market that works with 5 communication interfaces at the same time. Ethernet and 4G are used to send the data to the Cloud, while low consumption radios like 802.15.4/ZigBee are used along with long range RF 868/900MHz technologies to get the data from the sensors. WiFi radio is also available to access and control the device” says David Gascón, Libelium CTO. The new Meshlium also includes for the first time an expansion port to enable the direct connection of I2C, USB or UART external devices. This allows high bandwidth devices, such as cameras or industrial sensors, to transmit large volume of data to the Cloud and will increase Libelium’s IoT Platform ecosystem and interoperability. 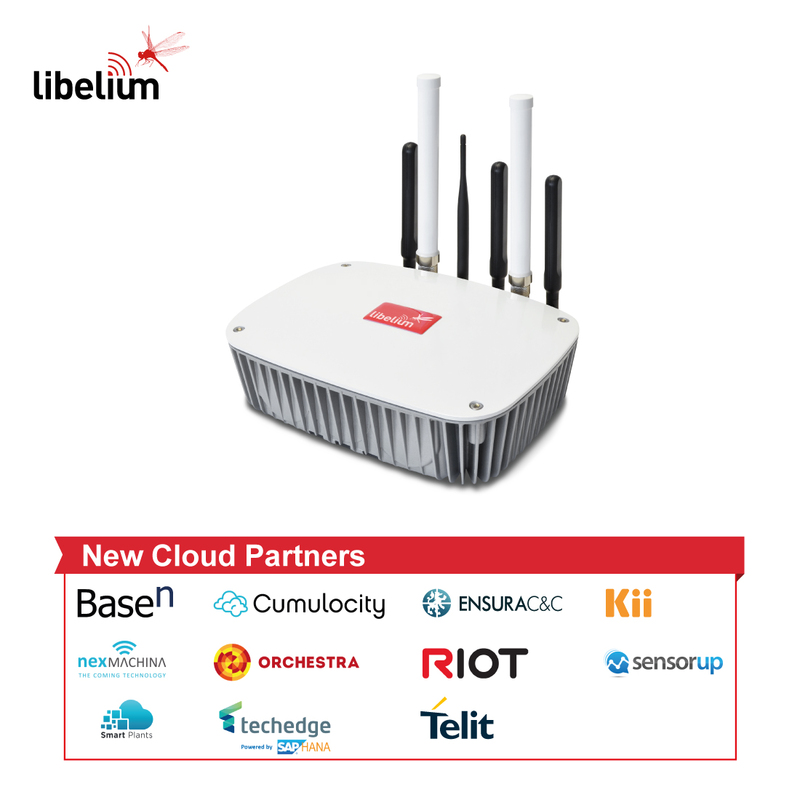 Libelium IoT Ecosystem grows up with Basen, Cumulocity, Ensura, Kii, NexMachina, Orchestra, Riot, Techedge (for SAP connection), Sensorup, Smart Plants and Télit. They have joined forces with Libelium to speed up IoT adoption through their integration on Meshlium IoT Gateway. Currently, Libelium is also integrating the first Latin American Cloud partner, Haibu. The compatibility with any cloud platform allows to develop in an easy way new IoT applications for smart cities, precission agriculture, smart environment and smart water management. New partners have joined to existing Cloud platforms as AWS, Azure Microsoft, IBM Bluemix, Indra, Telefonica or Thingworx. BaseN is the inherently scalable computing Platform for hosting billions of spimes, the core objects of the Internet of Things. Spime is the permanent logical brain and memory of any physical Thing. BaseN currently handles close to one million spime transactions per second, and enables the transformation from physical products to intelligent services in any industry. Cumulocity is the leading carrier grade IoT platform for connecting, managing and integrating things into enterprise business infrastructure. Cumulocity is used by 100+ customers via 1,000+ tenants deployed on-premise and across 20 global cloud hubs. Our open platform is fully featured allowing customers to realise and scale their own IoT solutions rapidly using our UI framework and publicly documented APIs. Our 2,500 strong developer community enhances our active partner eco-system. Read the pres release at Cumulocity. ENSURAC&C’s mission is to design and deliver advanced Internet of Things (IoT), Video Management Solution (VMS), and Command & Control (C&C) products. We empower end users to configure and manage integrated networks – from Smart Cities, through Transportation Hubs, to Emergency Responses. Kii offers a best-in-class, carrier-grade IoT Solution Enablement Platform — our Device Agents, SDKs, APIs and tools enable partners to more easily and rapidly develop, deploy, and manage consumer/enterprise IoT solutions. Kii’s unique Thing Interaction Framework enables Service Provider partners to onboard, manage and deliver disparate devices/categories more quickly/cost-effectively as they build rich IoT solutions. Nexmachina is formed by a team of experienced professionals in the world of computer systems, technologies and wireless communications. Their challenge is to apply their knowledge to the new era of the Internet of things, offering solutions that enable towns, cities and businesses have smarter infrastructures to be more efficient, sustainable and livable. Orchestra is an IoE platform designed to collect real time location analytics data and to give insight on metrics and KPIs that are hovering over your venue. One simple dashboard lets you act on data and create synergy in processes that involve people, things and machines across your venue. RIOT is a Sensing as a Service Platform developed by REDtone IOT. It manages connectivity from sensors or data sources with various communication protocols including MQTT and RESTful. The main goal is to allow the creation of Smart City solutions that enable cities to monitor its most important assets such as rivers, buildings, parking lots, transportation, roads, drainage, environment, etc using Internet of Things (IoT). SensorUp provides a data exchange platform for the Internet of Things based on international, open, geospatial standards. SensorUp’s platform is the world’s first and most complete, ready-to-use, compliant implementation of the OGC SensorThings API standard. SensorUp’s staff are experts in geospatial Internet of Things data management. Read the press release at SensorUp. Smart Plants capture and process the data surrounding your business, for you to make better informed decisions. We connect from ventilation systems to green houses, making real time data streaming from these and provide you with an overview for better decision making. Techedge mission is helping organizations become more agile by fully exploiting the value of IoT technology throughout every stage of their business transformation providing Business Solutions and IT Services that come from an ability to combine business knowledge, technology expertise and passion for innovation. TechEdge has developed a solution for digital transformation for IoT scenarios, which allows incorporating the information gathered from the wireless sensor network technology Libelium in the Cloud SAP platform (SAP HANA Cloud Platform). Telit is a global leader in Internet of Things (IoT) enablement. The company offers the industry’s broadest portfolio of integrated products and services for end-to-end IoT deployments – including cellular communication modules in all technologies, GNSS, short-to-long range wireless modules, IoT connectivity plans and IoT platform services. Read the press release at Telit. ← Will IoT Create or Kill Jobs?